One of the places Tutubi ate out in Ormoc reminded him of Jo's Chicken Inato on Jupiter St. in Makati and the original one in Dumaguete City. Chicken inato, literally meaning "our chicken" or "homely chicken" in English is special marinated chicken bar-be-queued to golden brown appetizing goodness. Upon getting the menu, he ordered chicken thigh for only PhP65.00, cheap by Manila standard where a similar meal costs aboout Php100 or more. 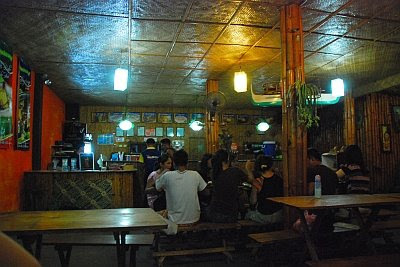 the bahay kubo ambiance of the place is good, though the lights are too dim for practical photography of food if you don't have additional light with you. Chicken Ati-atihan's tagline: Mapapasayaw ka sa sarap! What's your favorite bar-be-qued chicken? Chicken inasal? chicken inato? or your own secret chicken bbq recipe? There's another restaurant in Ormoc by the same owners of Chicken Ati-atihan serving the same chicken inato (and also offering franchise) but Tutubi forgot the name. Penong's in Davao is good, but so is (or was?) 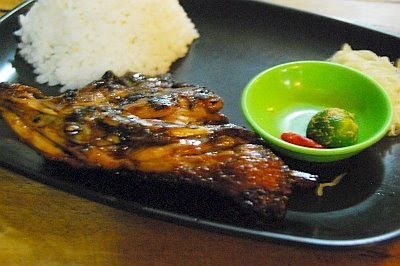 Chicken BBQ at Dusk Til Dawn (also in Davao) which was served with a special caramelized onion dip..yum! I've never tasted the ones you're mentioning. I guess we have rather plain BBQ spicy mix over here in Sweden. yum! but is the white meat tender? i had experiences with barbequed chicken in some restaurants. they're coarse though they look palatable. hahaha... i think the tag line is catchy. but i wont eat it. i might just dance all the way. The chicken looks delicious! Seriously, I'm craving for some good Filipino food now. kyels, doesn't just look delicious, it's really delicious. sadap makan!